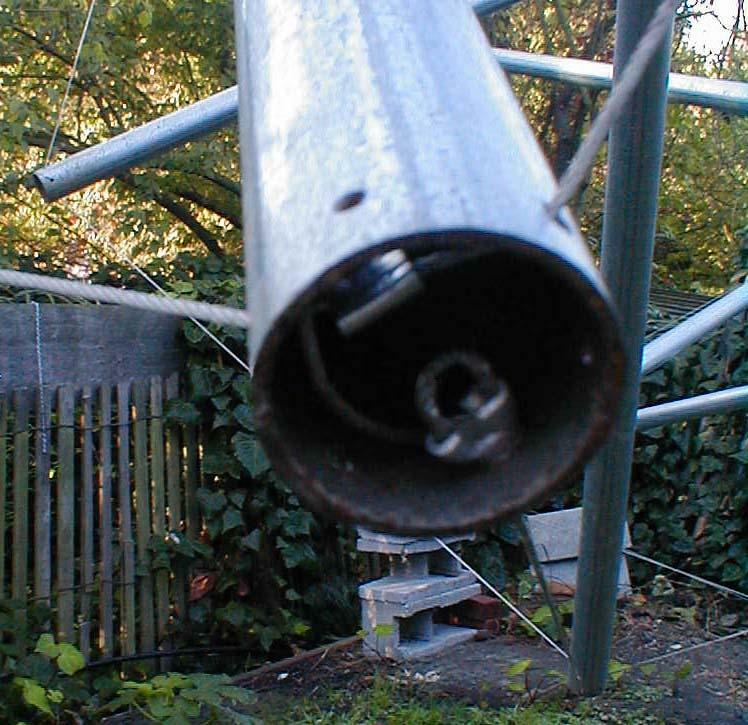 February 18, 2003, I received this photo of an arch Maxim Schrogin designed and built in the Berkeley, California, area. He also sent me photos on October 20, 2002. Maxim says the arch was built in 2002 as an entry arch to the sacred space of his nephew's wikken wedding in Tilden Park in Berkeley, California. Maxim's topology is interesting. Unlike mine (both towers and arches), Snelson's and deployable towers I've seen by academics, his tensegrity-prism stages don't alternate in their twist. They all twist one way which creates a sort of spirally effect. He also uses one less tendon per stage than I do which is two tendons less than Snelson since Snelson uses a diamond topology while I use a zig-zag topology. I speculated his arch must be jiggly, and Maxim replied (email December 7, 2003) "my arch was jiggly as a straight tower, but is firm when stressed as an arch". 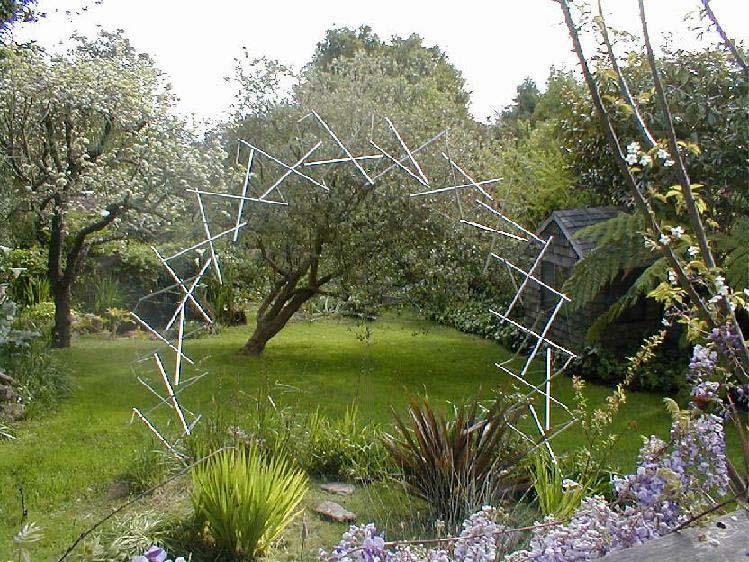 He also referred me to a photo of the "Rainbow Arch" tensegrity which Kenneth Snelson built in 2001. The photo is in an advertisement for an exhibition of Snelson's works sponsored by the Marlborough Gallery entitled "Kenneth Snelson: Sculpture" (September 10 - October 4, 2003). The advertisement appears on p. 3 of the September 2003 issue of Sculpture magazine. Snelson's "Rainbow Arch" is a half circle and has 20 stages with two additional stages of larger struts serving as the bases. A photo is also available at his website.